Do you feel confused about which dairy free milk you should choose for your toddler following a dairy free, milk free or plant-based diet? Perhaps you worry that it doesn’t contain enough protein and whether it should contain any vitamins and minerals. Or you are not sure how much plant drink your toddler should be having each day. I reviewed five different plant drinks in the following video and podcast episode. Keep reading to find out my findings or you can scroll down to listen to my recommendations in the brand new podcast episode. Short on time? No problem, I’ve summarised my recommendations for choosing a dairy free milk for your toddler into a handy downloadable checklist. Simply subscribe to the podcast newsletter and send me an email with the heading ‘dairy free plant drink checklist’ and I’ll gladly send you a copy. Let’s review the options available in supermarket shelves and tease out what’s appropriate as a breast milk substitute or even a prescribed special formula by your GP or paediatrician. Remember, we are discussing suitable alternatives for your toddler who is at least over the age of 18 months. Plant-based dairy free milks are never appropriate as a substitute for breastmilk or infant formula for babies less than 12 months of age, even if they have been diagnosed with a dairy allergy (also known as cow’s milk protein allergy). But before we get right into the different dairy free plant drinks for your toddler’s plant-based diet, I’d like to invite you to download for free five tasty dairy free recipes for kids. It’s super handy to have these five delicious dairy free recipes up your sleeve for any upcoming children’s parties. You’ll receive a biscuit recipe, an avocado and chocolate cake, as well as a plum tart recipe which is available exclusively only in this downloadable dairy free guide. So, go on, check it out and let me know what you think. And as a bonus if your child is also following a gluten free diet, I’ve included instructions for you on how to manipulate the recipe so that it’s suitable on a gluten free diet, so I hope you enjoy them. If you’ve been thinking about moving away from breastmilk for your toddler or a specialist infant formula provided to your child to help manage a dairy allergy and the idea of a plant drink entices you, how should you select the best one? The decision does eventually boil down to personal preference but praise the plant drink that has been created with some consideration to nutrients such as calories, protein, B vitamins, calcium and iodine. Selecting the ideal plant drink is not as easy as you might think, as some nutrients, vitamins and minerals require careful consideration. For background reading on whether vegan diets see ‘Are Vegan Diets Safe For Children?’. In this article, I’ll guide you through how to select a plant drink for your toddler with a dairy allergy or following a plant-based diet. I’ll encourage you to consider the overall fat, protein, calories, calcium, B and D vitamins as well as any iodine that a plant drink may provide. I thought we’d start with coconut milk as it’s really popular at the moment. Initially, coconut sparked a lot of interest with it’s unique fat composition consisting of a small amount of medium chain fats (see Coconut Fat – Friend Or Foe?). An important question to ask when you pick up a carton or any plant-based drink is – where’s the added calcium? Obviously, cow’s milk is rich in calcium and regardless of the role of alternative sources of calcium enriched foods on a plant-based diet, cow’s milk would usually be the main source of calcium for toddlers. This essential bone building mineral should therefore be replaced in any plant drink that you choose for your little one. This is especially important if you are switching from a prescribed milk free infant formula to a dairy free plant drink. If you have your heart set on coconut based drinks and you are interested in organic varieties, this is perfectly fine, but just make sure that the brand you choose is calcium fortified. Some organic varieties are notorious for skipping important minerals such as calcium. 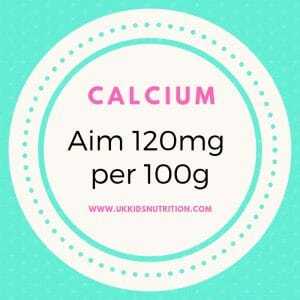 How much calcium for strong bones? We’ve established that plant-based drinks require added calcium to help meet your toddler’s requirements. Children aged between 1-3 years of age, require 320mg calcium per day. Select a brand offering around 120 mg per 100ml. That’s the amount of calcium that you would find naturally in cow’s milk and the amount that you would usually find if you look at the back of the cartoon and along the 100ml column for calcium. Although you can find brands of coconut drinks that are calcium fortified (look for brands providing at least 120mg of calcium per 100ml), when you screen for protein this is where coconut drink is going to let us down. The protein content is disappointingly low, as are the overall calories. With the exception of Koko’s latest chilled coconut drink range offering 1g protein per 100ml, there’s usually only around 0.2 – 0.5g protein per 100ml in most brands of coconut drinks. To put this into context, let’s have a look at cow’s milk. There’s about 3.3 grams of protein per 100ml so 0.2 grams in coconut milk in contrast is ridiculously low. Now I know what you’re going to be asking me, does it really matter? Could protein requirements be met by using alternative plant or animal sources of proteins from your child’s diet? Absolutely, we could certainly have a conversation about your child’s eating pattern and choices and manipulate the diet. However, just bear in mind that kids at this age are unreliable eaters. Their appetites vary as do their food preferences. Toddlers can be agonisingly fussy eaters. If this is something that you’re worried about, you are right in that children’s protein intake can be compromised. I believe that sometimes we can overhype protein requirements for children. If your child is eating a lovely range of foods they are probably meeting their requirements for protein. However, if your child’s dairy free drink is a plant-based drink like coconut, most brands are low in protein, and it’s possible that on some days, your child is not getting enough protein. Coconut milk is fine for you mummy if you enjoy it in your coffee or cup of tea but sadly for children they just need a little more protein from a dairy free plant-based drink. The exception is Koko’s newly released range called ‘Koko dairy free super’ which contains per 100ml, 1.2g protein, 2.5g added sugar, 170mg calcium and modest additions of iodine and vitamin B1. I walked down the supermarket aisle and I spotted tiger nut drink. That sounded really interesting. So, I inspected the ingredients list and it was predominantly rice based (it’s listed as one of the main ingredients). If you’re not sure why rice drinks are contraindicated for young toddlers, food standards agency clearly states that children under the age of five years should not be offered it as a dairy free substitute to breast milk, infant formula or cows’ milk even if your child has been diagnosed with a dairy allergy. This is due to the presence of arsenic that’s naturally present in rice and rice related products. Shocked? Try not to worry. You wouldn’t be expected to eliminate all sources of arsenic from rice or rice related products from your child’s diet. Your toddler could however, drink between 300-500ml of plant-based drinks daily, so his/her exposure to arsenic from a rice-based drink is significantly higher compared to a heavier adult. It’s down to body size and that’s why children under the age of five years should never be offered rice drink as a dairy free substitute to cows’ milk. I reviewed hazelnut and the almond drinks range. Unfortunately, it’s the same story for protein. It’s just too low in protein for young children. Some brands are also not fortified with calcium so just be careful about checking the back of the carton to check what’s actually been added. Some brands like the Alpro range do have calcium added as well as B vitamins and vitamin D. The protein is still problematic as are the calories which are too low for young toddlers (particularly if your child has a tendency towards fussy eating). And like I mentioned earlier, toddlers can be unreliable eaters. They can eat quite a bit at one meal with a lovely range of foods but then over the next few days may not be very interested in protein or calcium rich foods. For peace of mind, it is recommended to pick a drink that’s going to be a suitable substitute for breast milk or cows’ milk from about the age of 18 months with a decent profile for protein. I’d recommend picking brands that offer at least 1g of protein per 100ml. Do watch out for organic varieties, not all brands are fortified with calcium. If your preference is a nut-based plant drink then your toddler will need an alternative calcium supplement. Equally, some brands don’t include any B vitamins or vitamin D either so encourage toddler to enjoy their two portions of fruit and three of vegetables daily for their vitamins! You could use hemp milk and some brands are fortified with calcium. 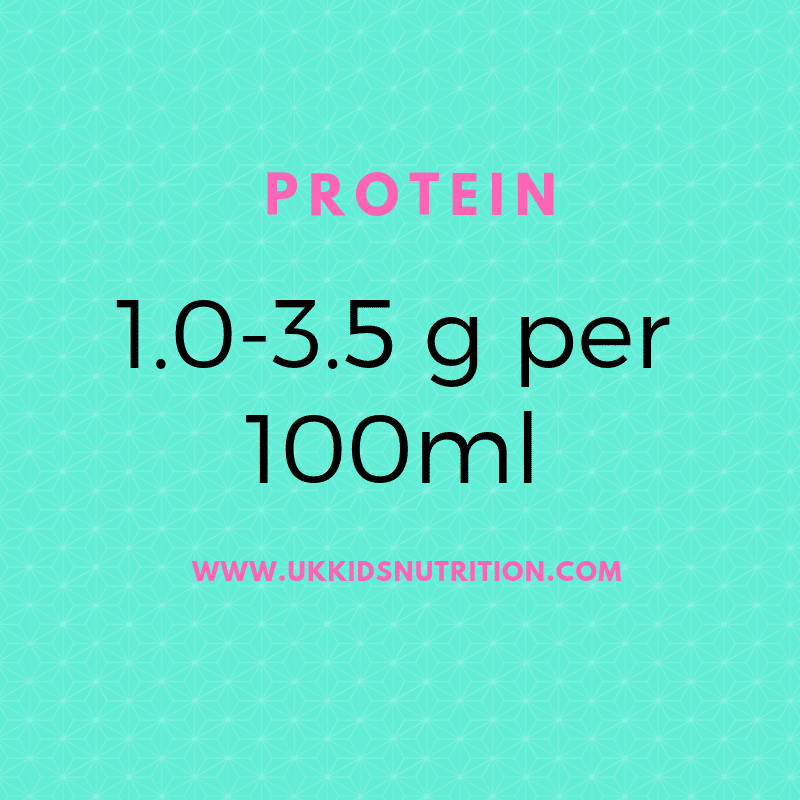 Regrettably, a quick scan of the nutrition facts table revealed low protein at 0.5g per 100ml. You now know that compared to cow’s milk which offers at least 3g of protein per 100ml, this is a very diluted drink nutritionally. There’s so much variety today if you are managing a toddler requiring a dairy free diet or if your family are pursuing a plant-based diet, therefore you may wish to walk past hemp drinks. I had a look at some of the oat drinks that’s available and there’s a good variety, including barista type drinks for us mums and dads following a dairy free diet. 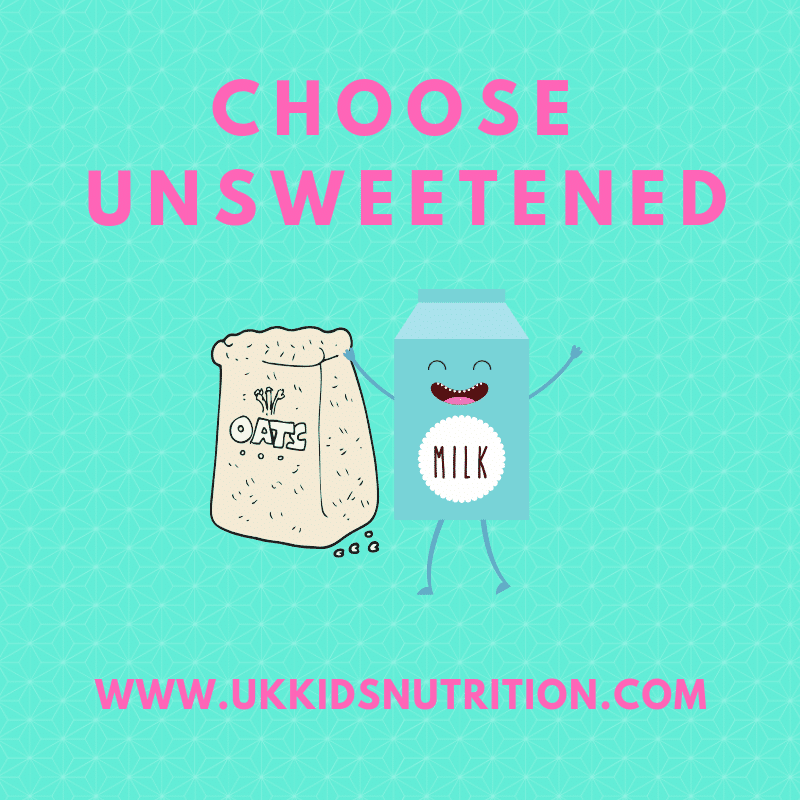 Your final pick should be unsweetened without added sugar for children so do read the nutrition tables. Once again, check for added calcium, vitamin D and vitamin B12. The good news is that some brands contain around 1g of protein per 100ml. That’s a decent offering of protein and double the quantity found in nut, hemp and most coconut drinks. We’re getting closer to the protein profile that I’d like to see in a plant drink or an alternative to breast milk and cows’ milk for our young toddlers. We’ve discussed protein in length because it’s an essential nutrient that will help your toddler grow. Without the right level of protein in your child’s diet, their linear growth such as height can be compromised. Protein is also key for muscle and tissue repair so it’s imperative that your toddler’s basic requirements for protein are met through a balanced diet. I won’t deny it, this is my preferred cow’s milk protein free alternative drink is definitely soya. Why? There’s at least 3.0-3.5g of protein per 100ml which is exactly the same as cow’s milk. Soya drinks have transformed over the years. You can find brands without added sugar, roasted or unroasted, organic with added calcium (120mg calcium per 100ml) and with added B vitamins and vitamin D.
The recently released Alpro range include a toddler growing up drink based on soya with added iodine and vitamin B12. This is a bonus if your child is following a vegan or plant-based diet and you are looking for a cows’ milk substitute with iodine for your toddler. Iodine is an important mineral that can potentially be lacking in vegan diets. The main source are animal products including cow’s milk. Your body uses iodine to make thyroid hormones which are important for the normal development of the brain and bones particularly during pregnancy and in infancy. Do shop around as Marks and Spencer as well as Morrison’s also offer soya drinks with added iodine. Don’t forget to consider your chosen brand’s profile for protein, overall calories, B vitamins and vitamin D.
Are you still struggling to pick the right plant-based drink for your toddler? If you enjoyed this article and you’d like guidance from a paediatric dietitian book a free initial call here to discuss how I can help you. I’ve covered just about all of the possible plant-based drinks for your toddler on a dairy free or plant-based diet. Soy, which is my favourite has the best profile for protein. You can find brands that are unsweetened without added sugar and with calcium added at a similar level to cow’s milk. Up to a quarter to half of children diagnosed with cow’s milk protein allergy can react to soya, so do consult with your paediatric dietitian to check whether soya is right for your child. Oat and one particular brand of coconut is the next possibility with around 1g of protein per 100ml. Oat drink may not be suitable if you’re child needs to follow a gluten free diet but it certainly is reasonable option. It’s preferable to most coconut, nut and hemp drinks. 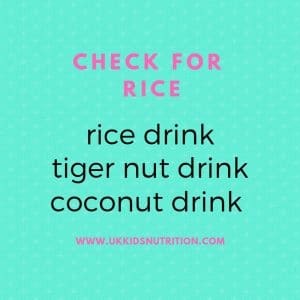 Rice and tiger nut drinks are unsuitable due to the presence of arsenic and should therefore be avoided if your child is under five years old. Final tip, do check coconut drinks as some brands use rice drink as an additional ingredient which is contraindicated for toddlers. ARE YOU LISTENING TO THE HEALTHY EATING FOR KIDS PODCAST? 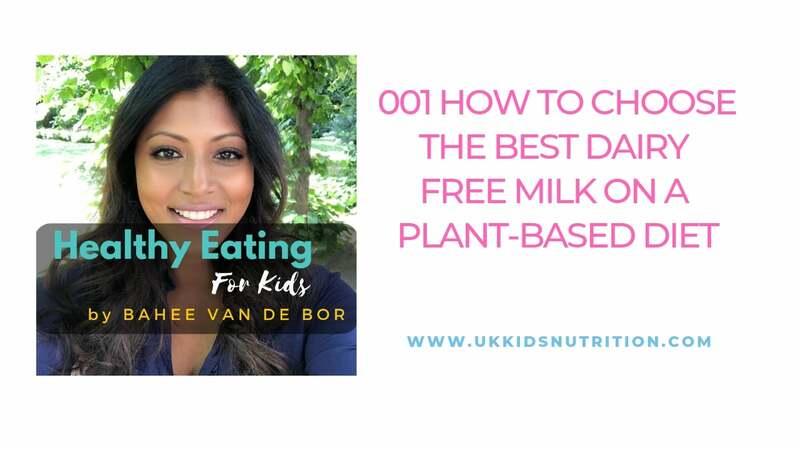 Does it feel like your child has regressed from what used to be good eating and you just need help expanding the variety of their dairy free diet? Book a free initial consultation to see how I can help you or see my expert consultations to book your first Skype/video or face to face appointment. I will be listening! And thank you for providing an easy-to-follow written version too – so useful!